AVIVA CEO Regina Bette and board chair Genevieve Haines. 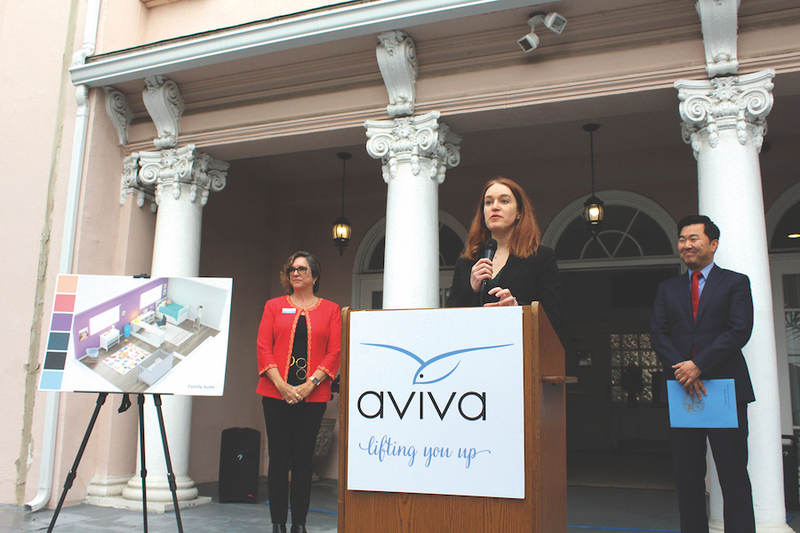 Aviva Family and Children’s Services, along with Councilman David Ryu, broke ground last month on construction of an innovative bridge housing residential program for young women. Also last month, progress was made in bringing a bridge housing project to Councilman Herb Wesson’s adjacent council district. Construction of the 42-room residential structure on the corner of Hollywood Boulevard and Camino Palmero Street in Council District Four is expected to last five months and will focus on upgrades and renovations to the already existing property, including making bedrooms and bathrooms ADA compliant, as well as building kitchenettes and lounges throughout the property. Set to open in July, the residence will also provide counseling, job training and life skills to young women between the ages of 18 and 24 who are homeless. “Very few organizations have as much experience running intensive residential programs for high-needs groups as Aviva. In fact, we got our start 104 years ago by housing young women who had nowhere else to live,” said Regina Bette, Aviva president and CEO. According to the most recent Greater Los Angeles Homeless Count, 30 percent of Hollywood’s homeless are between the ages of 18 to 24, a population known as “transitional age youth,” and up to 40 percent of them have some experience with the foster system. The residential program will build upon Aviva’s extensive experience with this population while also extending its reach to help address the housing crisis. “Aviva serves families and young people in crisis in Los Angeles,” said Genevieve Haines, board chair and Windsor Square resident. “Even though Aviva’s services are comprehensive, we can’t keep up with our clients’ housing needs in the Los Angeles market. With this home, we’re able to offer a more complete spectrum of care to young people aging out of the foster care system and on the brink of homelessness,” Haines added. The program’s target population of transitional-age female youth will include mothers and their children. They will receive food, clothing, mental health services and case management. They will also have access to educational resources, allowing them to enroll in college classes or complete a GED or an online learning program. Through Aviva’s Family Resource Center, the women will have access to a wide range of independent-living skills, professional development and artistic self-expression opportunities. A kitchen, beauty salon and apparel closet can also provide hands-on experience and “internships” to residents who have shown a professional interest in these fields. From the Los Angeles City Council, the Aviva residential project received approximately $2.3 million in funding from the Homeless Emergency Assistance Program (HEAP). Ryu submitted the funding motion that was approved in January by the full council. “I’m honored to partner with Aviva Family and Children’s Services to bring bridge housing for transitional-aged youth to Hollywood,” Ryu said. In addition to the Aviva and several other bridge housing projects underway in Councilman David Ryu’s Council District Four, there has been a big breakthrough in selecting a site for a bridge housing facility in City Council President Herb Wesson’s adjacent Council District Ten. Last May and June saw a rocky start and community rejection when the CD10 Office proposed a site for temporary homeless housing on a city parking lot on Vermont Avenue near Wilshire Boulevard. In the ensuing months, a collaborative process with representatives of three neighborhood councils and other community leaders has resulted in a consensus supporting the selection of another site for a bridge housing project — a triangle of City land south of Wilshire Blvd., across from the Lafayette Recreation Center. A large gathering of neighbors and homeless housing advocates met at the recreation center March 13 to review the drawings for the project and to speak with various experienced homeless service providers and Councilman Wesson and his staff. The positive spirit in the room seemed destined to move the project forward quickly, according to attendee Marilyn Wells, co-founder with Allison Schallert of Stories from the Frontline. The organization is bringing accurate information to residents across the city concerning the steps to get people off city streets and into affordable housing. A contingent of Greater Wilshire neighbors was present to show support for the efforts of: Herb Wesson and his office; the adjacent neighborhood council leaders; United Way; KTown for All; the Office of the Mayor and People Assisting The Homeless (PATH), among others. Locals at the meeting in addition to Wells and Schallert included Geri Hurley, Judy Vaughan, Michele Richards, Joe Waz, Margaret Ecker, Meridyth MacDonald, Alysoun Higgins, and Linda Salas.